Art from ‘Bone: Vol. VII – Ghost Circles’ by Jeff Smith and Steve Hamaker. Gobbledygeek episode 249, “Bone: Vol. VII – Ghost Circles (feat. Greg Sahadachny),” is available for listening or download right here, and on iTunes here. Great darkness falls across our podcast. 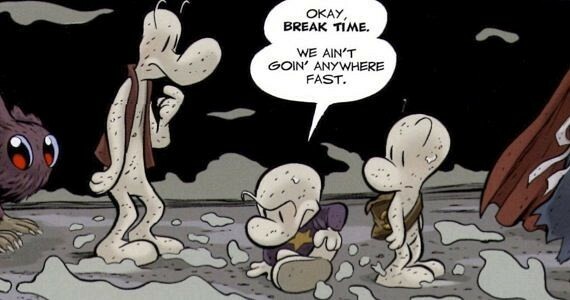 May Paul, AJ, and Greg Sahadachny of The Debatable Podcast and All the Pieces Matter be equal to the burden as they continue their year-long Four-Color Flashback series on Jeff Smith’s Bone. This time, the gang turns to Vol. VII: Ghost Circles; if they thought everything happened last volume, even more everything happens this volume. Which begs the question: how much is too much? How many mythology infodumps before the series threatens to crumble beneath their weight? The gang discusses how the extensive exposition fits into Smith’s otherwise impeccable structure, how this cute lil’ comedy is handling its transition to dramatic fantasy epic, and–oh yes–the return of young Bartleby. Next: it’s that time of year, ghouls and boils. Gobbledyween 2015 kicks off with a return appearance by Greg to discuss John Carpenter’s cult classic They Live. This entry was posted in Shameless Self-Promotion and tagged adventure, bartleby, bone, books, comedy, comics, fantasy, fone bone, gobbledygeek, graphic novels, gregory sahadachny, itunes, jeff smith, libsyn, literature, phoney bone, podcast, smiley bone, steve hamaker. Bookmark the permalink.